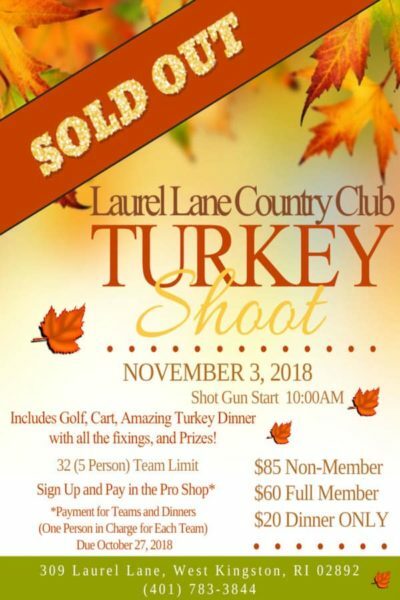 TURKEY SHOOT IS SOLD OUT! The TURKEY SHOOT is officially SOLD OUT. We are looking forward to a good time on November 3rd! The Turkey Shoot fills up quickly. If you would like to play next year, please sign up early next season in the Pro Shop. If you would like us to add you to the list, please contact Dale. Previous: Patriots Party December 9th and 30th at Laurel Lane! Next: CONGRATULATIONS TO NICK COCCIO AND TEAM!